^ Cassius Dio, Roman History, Book 77, Sections 11?15. ^ Cassius Dio, Roman History, Book 76, Sections 14 an 15. ^ Clement of Alexandria, Stromata, ii. 20; Eusebius, Church History, V., xxvi., VI., i. ^ "Life of Septimus Severus" in Historia Augusta, Section 19. Birley, Anthony R. (2000) . 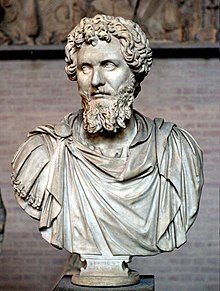 Septimius Severus: The African Emperor. London: Routledge. ISBN 0-415-16591-1. Continuite gentilice et continuite senatoriale dans les familles senatoriales romaines a l'epoque imperiale, 2000. A. Daguet-Gagey, Septime Severe (Paris, 2000). Herbermann, Charles, ed. (1913). "Septimius Severus" . Catholic Encyclopedia (in English). New York: Robert Appleton Company.